Dr. Oldendorf is an experienced primary care physician who has been serving residents of the Capital District for more than thirty years. He has been board certified in five areas of specialty including Internal Medicine, Family Practice, Geriatrics, Clinical Lipidology and Sleep Medicine. Dr. Oldendorf brings this unique experience and expertise to his daily primary care practice at Oldendorf Medical Services. Born in New York, Dr. Oldendorf was raised in Los Angeles and returned to the Capital District to attend Albany Medical College. He completed residencies in family practice and internal medicine in Los Angeles and returned again to Albany where he has been working as a primary care doctor since 1984. 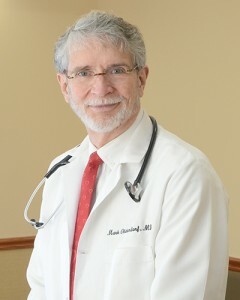 Dr. Oldendorf founded Oldendorf Medical Services (OMS), a privately-owned, physician-led practice in 2009. His mission was to create an environment where patients receive excellent health services in a caring and supportive atmosphere. In addition to primary care, one of Dr. Oldendorf’s areas of expertise is in heart attack and stroke prevention. Dr. Oldendorf is one of the nation’s experts in cIMT, a non-invasive, high-resolution ultrasound of the carotid artery that identifies atherosclerotic plaque. He served on the board of directors of the Society of Atherosclerosis Imaging and Prevention and was Chair of the Society’s cIMT Council. As part of his work in this area, Dr. Oldendorf co-authored the paper “Appropriate Use Criteria for Carotid Intima Media Thickness Testing” in the journal Atherosclerosis. This landmark article serves as a practical guide to all clinicians concerning the use of this ultrasound technology in the doctor’s office. Concerned about the steady increase of sleep issues in his patients and the connection between sleep apnea and heart disease, Dr. Oldendorf’s most recent Board Certification was in Sleep Medicine. Dr. Oldendorf passed his boards in 2009 and began using in-home sleep testing which allows his patients to receive a sleep study in the comfort of their own home. Along with his work as a primary care physician, Dr. Oldendorf is an accomplished musician who plays guitar, keyboard and the banjo. He is an accomplished singer and songwriter and can be seen out with his band, the Waldorfs.